Lambeth Council is currently consulting residents on a Conservation Area Statement for the Minet Conservation Area. The statement provides information on what makes the conservation area special, offers guidance for people wishing to make changes to their property and contains proposals for the future management of the area. Deadline for responses to the consultation is March 14. More details and copy of the Conservation Area Statement can be found here. There was a strong turnout at the meeting in Longfield Hall last Wednesday, when the proposed plans for Loughborough Junction were discussed. Chaired by Vassall Councillor Jackie Dyer, residents had a chance to raise any questions and concerns they have about the scheme which includes a proposal to close Calais Street. Find out more about the meeting and topics discussed on our traffic forum here. The deadline for comments on the Morrisons planning application is 23 September. This link will take you to the planning application from which you can register and comment too. Many of you will remember our friend Mel Browne, Chair of the Minet Conservation Association for over 20 years and a founder member of the Myatt's Fields Park Project Group. 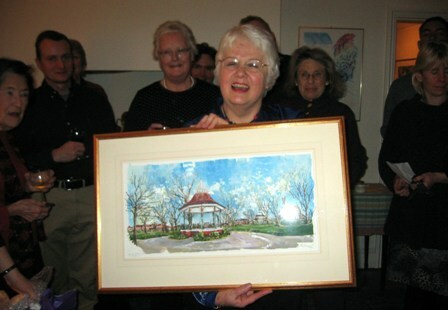 Mel ran the annual Fair in the park for many years and, as Chair of the MCA, helped to save Longfield Hall from being closed down, and sewed the seeds for many local projects, such as the park project, the Save the Minet Library Campaign, the Neighbourhood Watch Scheme, and many others. Sadly, Mel died in mid March. Mel's daughters Nick and Tammy have asked that friends and neighbours join with them to remember Mel's life with a celebratory picnic in the park at 1pm on Sunday 23rd May. 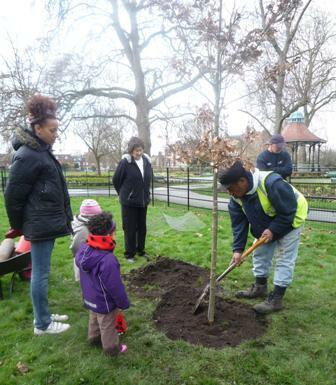 We have already planted an oak tree (photographed below) on the bandstand side of the picnic area and hope to be able to dedicate a bench in her name near the tree. Please do join us on 23rd May. Bring a picnic and a blanket. Latest news from the Minet Hub, the conservation area and the streets surrounding Myatt's Fields Park.